Now that Congress has gotten around to considering the “Families for ED Advertising Decency Act.” (It would limit advertisements for products like Cialis and Viagra to only be broadcast between 10 p.m. and 6 a.m.), it’s clear that Republicans have time to focus their energies on bigger fish, like saving their party from extinction. Watching the GOP self-destruct is starting to feel less like train wreck rubber-necking and more like witnessing a suicide. It’s amazing how recklessly and deliberately unbalanced they have become. Voter identification with the Grand Old Party is now just barely over 20%, and their attempts to stop the bleeding have consisting of issuing scare videos, pizza parties featuring party hacks, and an all-out assault on the Party’s leader for failing to use the “S-word” when referring to President Obama. With ex-President Bush’s library funded to the tune of $100 million and party leaders hosting fundraisers at Las Vegas strip clubs, it’s time for a fundamentally new approach. The party’s image needs are serious make-over. And there is no better place to start than with the GOP logo. The Daily Kos has done some serious work in this area, introducing a new graphic (dubbed the Goposaur) last month that merits serious consideration. Not only does this artwork capture the true “feeling” of the party, it has the built in advantage of appealing to younger voters, since we all know they love dinosaurs. Now that we solved that problem, it’s time to roll out my humble proposal to help Republicans recruit candidates and improve the party’s standing. Given the undeniable popularity of “American Idol” tv series, the party needs to sponsor a series of similar events at county fairs around the country. We’re sure that Fox-Tv won’t mind being copied for (what they would consider) a good cause. Hell, maybe they’ll even give ‘em some airtime–it worked for the teabaggers. More than anything, the party needs new faces, and what better way to attract people with a little fame and fortune. Potential candidates would be required to “audition” for a distinguished panel. Maybe they could give speeches and, perhaps, there could be a talent portion in the early rounds of the competition. Given the number of unemployed auto executives and stock brokers out there, I’m sure that any reasonable financial incentives will bring in a flood of applicants. The judges and host for this “Republican Idol” series are crucial to its success, and it’s important that they represent the best and brightest that the party has to offer. Given that this is a TV style event, the grand old faces of the Grand Old Party just won’t do. Besides, those guys are all busy saying “no” to the Democrat’s agenda. 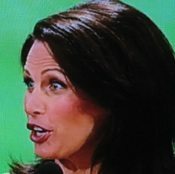 There really only one choice to act as host: Michelle Bachman, the glib, media savvy Republican Congresswoman from Minnesota, whose political career includes introducing the Light Bulb Freedom of Choice Act. ** Miss California (and Miss USA runner-up) Carrie Prejean. Ms. Prejean’s status as a conservative icon is unquestionable, given her recent alliance with the National Organization for Marriage to “protect traditional marriages.” The recent revelation that received free breast implants paid for by the Miss California Pageant can only help with her popularity. **Soon-to-be-unemployed Republican National Committee Chairman Michael S. Steele will round out the panel. His plan for an “off the hook” public relations offensive to attract younger voters, especially blacks and Hispanics, by applying the party’s principles to “urban-suburban hip-hop settings” make him an obvious choice. I’ve limited the judging panel to three, because (I think) it works better. If you have suggestions for a fourth member, please leave them in the comments. The Republican Party is anxiously awaiting your response. The Palin & Giuliani gown competition would be a show-stopper! One thing I can say for sure, you will over step. You always do. Give it a little time, see you in 2010.